One of the best ways to connect with people on SingSnap is to sing with them! Follow these easy steps to learn how to do both an audio-only duet, or an Infinite Duet! 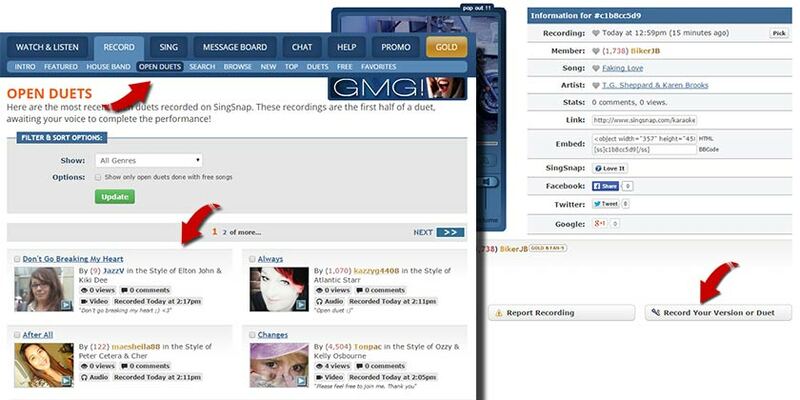 There are two ways to find recordings to duet with. You can click on the Record tab then on Open Duets to view recent open duets or you can find a recording and choose to duet with it. If you've chosen the Record --> Open Duets page you will be taken to the recorder when you choose a recording to duet with. If you've found a recording elsewhere and clicked on the "Record Your Version or Duet" button you will then need to click the "Duet with ..." button. When the recorder appears, it will have the original member's version loaded in to record with. Record as you normally would (audio only or video) and click the "Review This Recording" button when you have finished as usual. When the mixer loads, mix the music volume and timing as you normally would. You have the option (if you chose a video recording to duet with) of displaying all videos on the finished product. This option will be selected by default if you recorded with video. You can however choose to turn the Infinite Duet option off if you'd like. After adjusting the music/voice mix, timing and choosing if you want an Infinite Duet (video only) you would click on the "Save This Recording" button and save like normal. You've recorded your first duet!